The 8ft x 6ft Reverse Overlap Apex Shed is ideal for any type of garden storage. Made from high quality ethically sourced timber, this garden building features 8mm thick overlap cladding that forms a strong and water resistant wall. The cladding is supported by a 28mm x 28mm framing, which creates a robust structure. The roof and floor have been built using a 9mm thick solid sheet material, this helps create a rigid base that can withstand general daily use. The reverse apex roofline provides extra internal head room that is ideal for storing taller items. Even though the apex design helps with water drainage, sand felt is supplied to protect against rot. The single window is made from styrene glazing, which is 100% shatterproof, this is ideal if you have any children or animals. The single door has been braced with ledging to provide extra support, a pad bolt is included for security. This shed offers great value for money storage space that will last for many years to come. Review:Good quality. All pieces sent and instructions. Review:We've built 4 sheds now and have got a system going. It does need two people to build it. Instructions aren't too bad to understand. You need a stronger piece of wood for the ridge beam, but otherwise it does what we need it to do. Our Reply:Thank you for leaving such constructive feedback, I will ensure that the correct departments are made aware. Review:Bad product very poor value for your money 6 x 8 Waltons Reverse Overlap Apex Wooden Shed. Fantastic to hear that you're pleased with your spacious building. We hope you enjoy using your building for many seasons to come. Review:I am very happy with the quality of the shed and instructions to put up were clear. It looks good too. 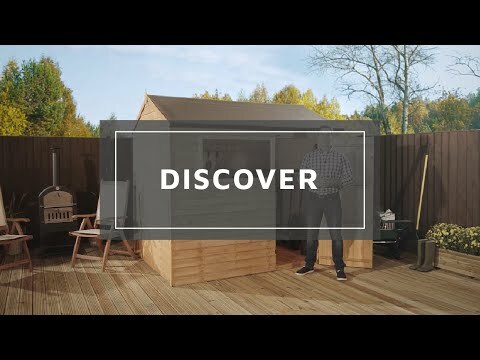 We're pleased to hear that you are happy with the quality of your shed and that your assembly went well. We hope you enjoy using your building now the weather is getting a little nicer! It is great that you are happy with the quality of your overlap shed and I thank you again for your positive review. Review:My bunnies liked it a lot. Great to hear your bunnies are enjoying your Waltons Reverse Overlap Apex Wooden Shed! Review:A bit flimsy expected a sturdier fence. I am pleased that you are happy with your overlap shed overall and I thank you for your feedback. Review:For the price, a good product. Thank you for your review, it's great to hear that the product is what you were looking for. Review:Does what it says on the tin .. Everything fitted, no missing parts .. Magic! I am delighted to know that you are so pleased with your overlap shed and I thank you again for your feedback. It is wonderful that assembly was straight forward and that you are pleased with your overlap shed. Thank you again for your review! Review:Dead easy to erect. Good instructions too. I am pleased to know that you are happy with the quality of your overlap shed and that good instructions led to an easy assembly. Thank you again for your positive review! Review:As described on website and good quality for the price.Easy to assemble and did most of it on my own.You just need someone to hold the panels while you screw them together. It is fantastic to know that you are pleased with the quality and value for money of your overlap shed and I thank you again for your positive review. Review:Delighted with this for the price. The instructions were a bit hit and miss, and we'd never assembled a shed from scratch before so got stuck a few times. We had to improvise a little when we weren't sure and found the roof tricky to do, but it's a good shed for the price. I am so pleased that you are delighted with the value for money of your overlap shed and we take your comments on board regarding the instructions as we are always looking for ways to make improvements. Thank you again so much for your fantastic feedback! It is great to know that you are so pleased with the value for money of your overlap shed and I thank you again for your positive feedback. I am glad that you are happy with the quality of your overlap shed overall and should there be anything outstanding that we can assist with, please contact us on either 0800 029 1000 or service@waltons.co.uk. Thank you again for your positive review. It is great to know that you are happy with the good value for money of your overlap. Thank you again for your positive review! Review:So in the end I guess you get what you pay for , A cheap shed. Thank you very much for your excellent feedback! It is great to know that you are happy with the high standard of service you have received from us and also with the quality of your overlap shed. thank you again for your wonderful review. Review:Good shed,just as I wanted.Easy to assemble because of the straight forward instructions,very pleased. Thank you very much for your brilliant review, I hope you enjoy your new overlap building for many years to come. It is great to know that you are happy with the quality of your overlap shed and that assembly was easy and straight forward. Thank you again for your review. Review:Excellent service from start to finish ! It is great to know that you are happy with your overlap shed and that the instructions were easy to follow. Review:She'd easy to build. Good value for the price. I am pleased to know that assembly was straight forward and you found your overlap shed to be of good value for money. Thank you again for your feedback! It is great to know that you are pleased with your overlap shed and we thank you for your positive review! Review:A very good shed at a reasonable price would use again . Our Reply:I am delighted to know that you found your overlap shed to be of good value for money and that you would use Waltons again. Our Reply:I am thrilled that you are pleased with the great value of the overlap shed you have purchased. It is also great to know that assembly was straightforward for you and thank you again for your great review. Our Reply:I am delighted to know you are happy with your overlap shed and you feel it is good value for money. Our Reply:I am glad to know you are pleased with your overlap shed and thank you again for your feedback. Review:Good quality. travelling blocks were nailed on not screwed on that's was a complete pain took more than 30 min to get them off. Shame it wasn't predrilled. Our Reply:I am pleased that you are happy with the quality of your overlap shed overall and we take your comments on board as we are always looking for ways to make improvements and we thank you for your feedback! Review:Have only just put it together but all seems fine. Roof is a little awkward to line up but easily resolved. The window was covered in wood treatment so needs a good clean. Our Reply:I am glad that you are happy with your overlap shed overall and I apologise for any inconvenience caused with having to resolve the issues mentioned. Thank you again for your review. Review:Great prices and the shed is of a good quality! Our Reply:I am glad that you think your overlap shed is good quality and a great price. Our Reply:Fantastic to know that you think your overlap shed is great value for money and that you are very pleased with the result after the shed had been erected.